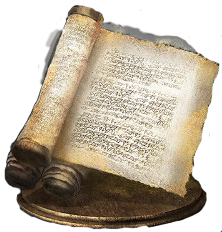 Golden Scroll is a Key Item in Dark Souls 3. Give to Orbeck of Vinheim to unlock golden sorceries. Farron Keep bonfire: Exit the room and head straight through the swamp past the Wolf Gate. Once you pass several Basilisks, keep going until you notice a large rock formation starting to appear along the right. Keep walking past them. Once you get beyond the rocks, you will find a cave which has the scroll inside. Faster Route: Farron Perimeter Bonfire; Head towards the sitting Ghru Grunt, turn right and go through the hole in the wall. When you drop, turn right towards the group of Basilisks. The cave is directly beneath you. If this is still confusing, use this map and look for number 3. Just adjacent to where this item is found, a dead mushroom can be seen which resembles Elizabeth, the mushroom woman found in Oolacile Sanctuary in the first Dark Souls. As this scroll contains sorceries from Oolacile, it could be inferred from this that the corpse is in fact Elizabeth. The description of where to go is wrong as *****. go to Farron keep perimeter then turn around and drop down the opening in the wall just before the sitting enemy. Then simply go to the right and there’s the cave opening. Very well thought out and put together site. Keep it up! Fe Xtra life does an amazing job at this wiki and I appreciate every bit of it! Thank you!! Easy way is from FARON KEEP bonfire. Go through Wolfs Gate and hug right until you reach the candles on right. Drop down and hug wall until you get to the cave. Got pestilent memory from golden scroll, maybe its based on amount of scrolls given? You do not get Pestilent Mercury* from the Golden scroll. You do not get this sorcery from the Golden scroll. It is currently available in the sorcerer shop, while none of the other sorceries from the Golden scroll are, and I literally just picked up the Golden scroll, it&apos;s still in my inventory. Golden Scroll is locate at Farron Keep.